On the South wall of the church. The plaque shown on the lower of the photographs is located below the window, on the left hand side. Adjacent to it, on the right, is a plaque to HW Jeans Esq FRSA which also states a claim to have erected this window. See also the adjacent window dedicated to Admiral Alfred Ryder and the memorial plaque to the Engineers lost on HMS Captain. In 1824-25, in the space of a little more than twelve months, the Cemetery witnessed the burial of two young victims of separate incidents of drowning, both of them members of prominent English families. The two tombs can be seen today, side by side. One is that of 18-year-old Charles Dudley Ryder, the other of Rosa Bathurst who was only sixteen. The story of Rosa’s tragic death in March 1824 was to grip the attention of the foreign community in Rome for years to come. She had fascinated Roman society with her beauty, intelligence and charm, only to be overwhelmed by the waters of the floodswollen river Tiber while out riding one day beyond the Ponte Milvio. The circumstances of Charles Ryder's death were quite different. As the inscription on his tomb relates, he was a midshipman on the H.M.S. Naiad whose captain was the Hon. Robert Spencer. On 28 May 1825 the midshipman was 'drowned with five of the crew by the upsetting of a boat at the mouth of the Tiber'. The names of the five seamen are given on the memorial stone located some 20m to the right of Ryder's tomb: Richard Gaudy, Stephen Perrin, Joseph Jones, John Macdonald and Joseph Nicholson. This was erected by Captain Robert Spencer 'as a testimony of respect and regret' to the seamen who were drowned while on duty from H.M.S. Naiad off Fiumicino. It is not known why the boat from the Naiad capsized. The Tiber mouth at that period was navigable only with difficulty because of the whirlpools and shoals created by the sand and debris carried downstream by the river; perhaps they played a role in the tragedy but this is speculation. 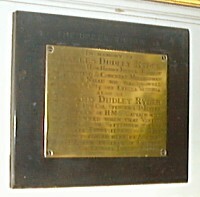 Charles Dudley Ryder was, as his tomb inscription states, the second son of the Bishop of Lichfield and Coventry, Henry Ryder. His elder brother went into the Church, and he – like many boys of his privileged background – joined the navy as a midshipman with the aim of becoming a commissioned officer after several years’ service on the lower deck. Captain Robert Cavendish Spencer (a great-great-uncle of Diana, Princess of Wales) took command of the frigate Naiad in April 1823. The end of the Napoleonic Wars had not seen the disappearance of what the British called ‘Barbary corsairs’ operating out of Algiers. In May 1824 boats from the Naiad attacked an Algerian warship off the port of Bona (modern Annaba). Charles D. Ryder is mentioned as one of eleven midshipmen from the Naiad taking part in this successful engagement. Only a year later his promising career was cut short when he was drowned at the Tiber’s mouth. Of Bishop Henry Ryder’s ten sons, Charles was not the only one who served his country well but who met an untimely death. The youngest son Spencer Charles Dudley Ryder was born only two months after Charles had been drowned (and was given his name). Having reached the rank of Lieutenant-Colonel in the Bengal Staff Corps, he died aged 47 and was buried in the English Cemetery in Naples. Three years earlier, in 1870, Spencer’s son Edward had been drowned while serving as a midshipman. 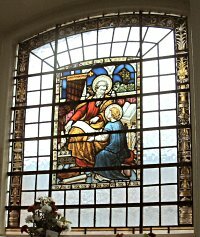 A memorial window to the two midshipmen, Edward and his uncle Charles (‘drowned off Civita Vecchia’ in 1825), can be found in St Ann’s Church in the Naval Base of Portsmouth in England. The window was donated by another of Charles’ younger brothers, Alfred, who by 1885 had risen to the highest rank of Admiral of the Fleet. Sadly, three years later he too was drowned when he fell into the river Thames in London. The adjacent Bathurst and Ryder tombs in the Cemetery prompt some reflection on fame and posterity. The tragic drowning of Rosa Bathurst is recorded in innumerable memoirs, poems and prints of the time, including the writings of Stendhal who was in Rome that year and was one of the many admirers of the young lady. By contrast, the loss of Charles Ryder and his crew from the Naiad has left few traces in the historical record. 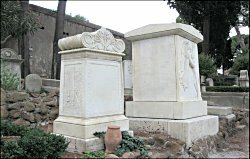 It is the monuments in the Cemetery that are the most visible memorial to these men who died while on active service for their country. May they all rest in peace."